If you’re like most folks, owning a home is the centerpiece of living the “American Dream”, but as every homeowner can attest, owning a home also means maintaining a home, which can seem like a full-time job without end. But there are smart home improvements and wise investments that not only help to reduce your maintenance chores, but can pay for themselves over the years and prevent the need for expensive repairs in the future. Is your roof protecting your home the way it should? Investing in your roof can be one of the most important decisions you can make in safeguarding your home over the long haul. Your home’s roofing provides the front line of defense against the ravages of winter, and doing all you can to protect it and make its job a little easier makes good sense. A mountain lodge with a dangerously heavy slab of ice and snow weighing down the roof. Roof heating systems eliminate this type of danger and help to protect roofs. In cold weather climates even the best of homes can fall victim to the persistent, destructive forces that patiently attack your roof every winter. Your roof serves as the barrier between your family and the ravages of Old Man Winter, but standing up to the determined forces of Mother Nature year after year is no easy task. For the most part, a well-constructed roof will repel the bulk of each icy annual offensive; however, after years of repeated assaults, winter may quietly string together a series of subtle victories that can eventually add up to threaten the integrity of the roof. Water needs only to find and exploit one small weakness in your roof to inflict major damage. The water seepage from roof vulnerabilities, often caused by ice dams, can be like a Trojan Horse that infects your home and quietly wreaks havoc before you realize the extent of the damage. 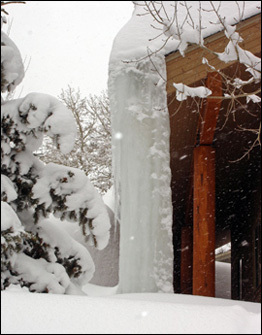 Ice dams are one of the most common problems associated with roof and water damage. A ridge of ice forms at the edge of a roof and prevents melting snow from draining properly. The water backs up behind the dam where it freezes and melts again. The repeated process of water freezing and melting gradually wears down even some of the best constructed roofs, and eventually water exploits the smallest opportunity to seep inside and gain free reign of your home. It can inflict costly damage to walls, ceilings, and insulation that can get out of hand in a hurry. Before long, mold and mildew join in the fray. Despite the growing damage, there are usually no visible signs that the roof has been compromised. Warmzone roof deicing and gutter trace systems can eliminate ice dams and heavy ice buildup in gutters and downspouts. These radiant heating systems may well be your roof’s greatest ally, extending the life of your roof and preventing costly structural damages to your home. There are several roof heating options that can be customized to meet your roofing needs as well as your budget. Warmzone deals only in top quality, proven systems at the best prices possible. Perhaps the service most appreciated by customers is Warmzone’s expert design services and radiant heat consulting. Simply call Warmzone to learn more and find out what options are available. You can also receive a free roof heating quote for your project. Call 888.488.9276 for more information.